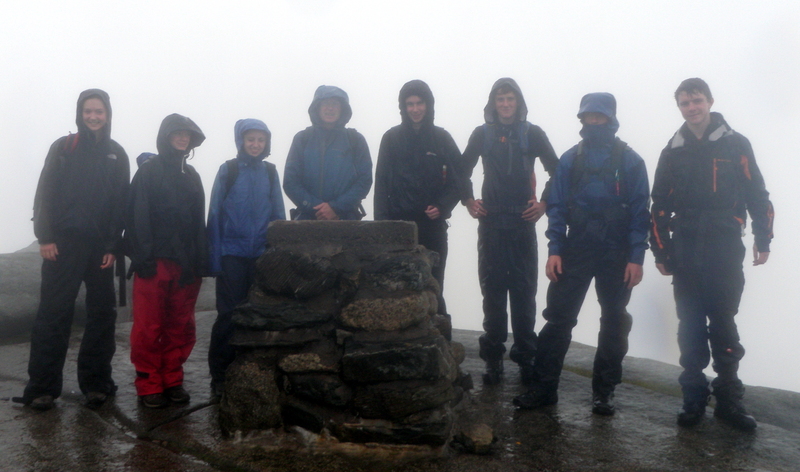 Last week was the last part of the SOAP mountaineering skills program … and it was destination Arran. 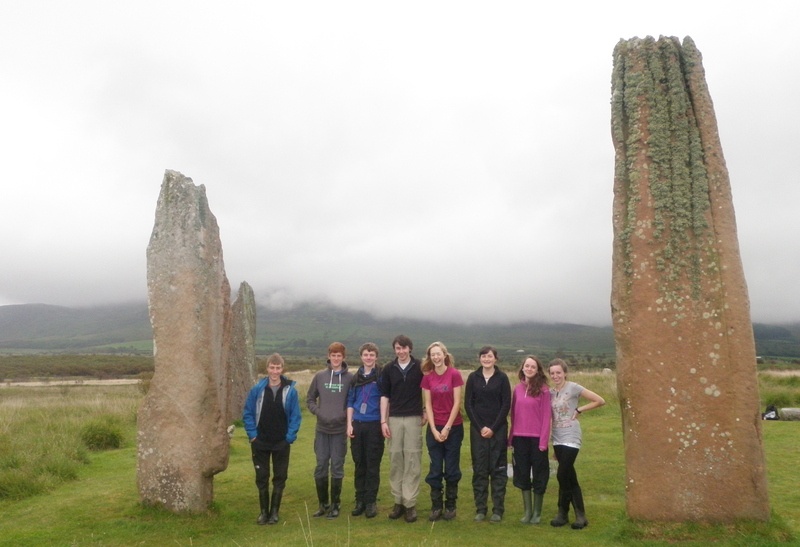 The program has run over this this year for eight S5 and S6 pupils across East Lothian’s schools, and the Arran Exped was the finale. While the Arran mountains are not high they have some of the best (and most exciting) ridge walking and scrambling in Britain. After gearing up in Musselburgh, it’s a short drive over to Ardrossan for the afternoon ferry to Arran. 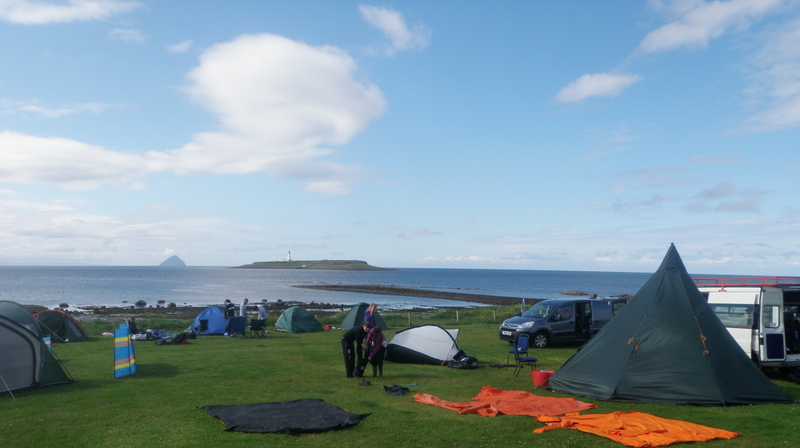 We were staying the first three nights at the very fine Seal Bay Camping down near Kildonan. After setting up camp the plan had been to visit a local single-pitch crag. It was a fine evening, bright and warm. Unfortunately as the wind dropped, the midges came out for the evening. Standing around belaying at a crag would have been murder… so Plan B was a walk along a midge free beach and a helpfully smokey driftwood bonfire. The ridge along to North Goatfell gave some easy scrambling to add interest, but it was a pretty wet day, with no sign of the fine views which we were sure were out there. Woke to rain and decided to try and stay low. So we set off north of Blackwaterfoot and walked up the coast, sheltering in the Kings Caves before visiting the fine standing stones of Machrie. Luckily the forecast was spot-on … after a night of very heavy rain sun came out as we packed up camp at Seal Bay. Even better there was breeze. Just enough to blow away the midges. Making the best of the weather we set off again for an great day of high ridges, and high visibility on the horse-shoe of Ben Tarsium from Glen Rosa. 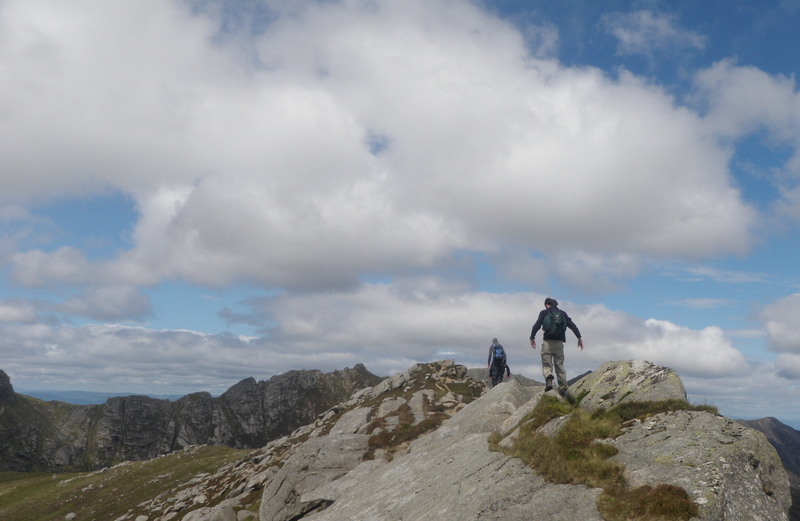 Lots of excellent dry granite, and views extending south to Ireland, out to Jura and north to Ben Nevis. A pretty tired group arrived back at the mini-bus at 7:00pm … and then had to walk in for the last night to our ‘surprise destination’ … Cloud Base. Despite being a bit midgy the it was luxury to not be under canvas for the last night. Another fine sunny day, and once out of the tree in the breeze midge-free. An easy walk down past the might Falls of Glashendale and back to the bus and off to the ferry. Despite some wet weather at the start a really good trip, the group were always in good spirits, achieved lots and came back with some great memories. Over the past year all of the SOAP participants have gained new skills and confidence that should help them be better, bolder, and safer, mountaineers in whatever adventures they want to embark upon after their school days. 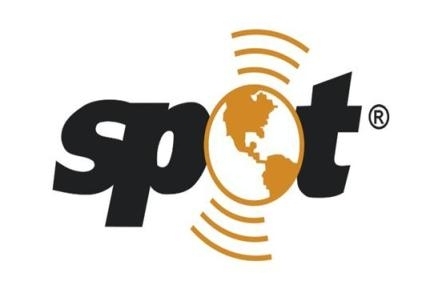 This entry was posted in Uncategorized and tagged hillwalk, SOAP. Bookmark the permalink. Well done to the team and to Andy and co for organising and running SOAP. The final exped looks absolutely amazing and I’m sure the memories with long outlast the midgey bites! Congratulations and thanks for the pics – they are truly inspiring! Thanks Andy! SOAP’s been a great programme, I’m really sad now that its finished. Overall I loved the extra responsibility we were given from the staff and allowed a relaxed environment to be created. Ever since health and safety has gone mad I feel Outdoor Education through Schools would never be the same, but SOAP changed that! 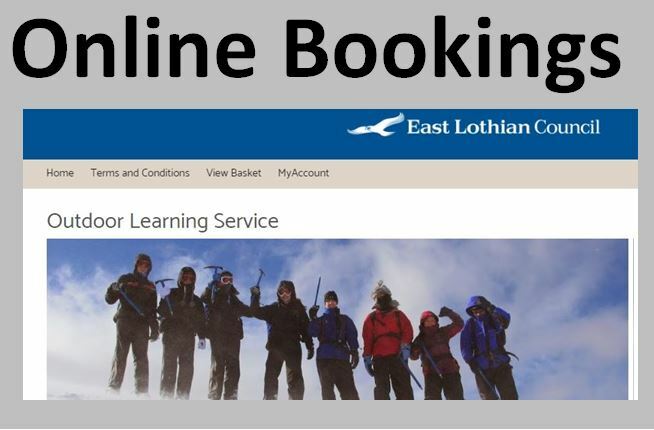 Very few negatives can be drawn from the programme however transport to the Outdoor centre in Mussleburgh was difficult some days. 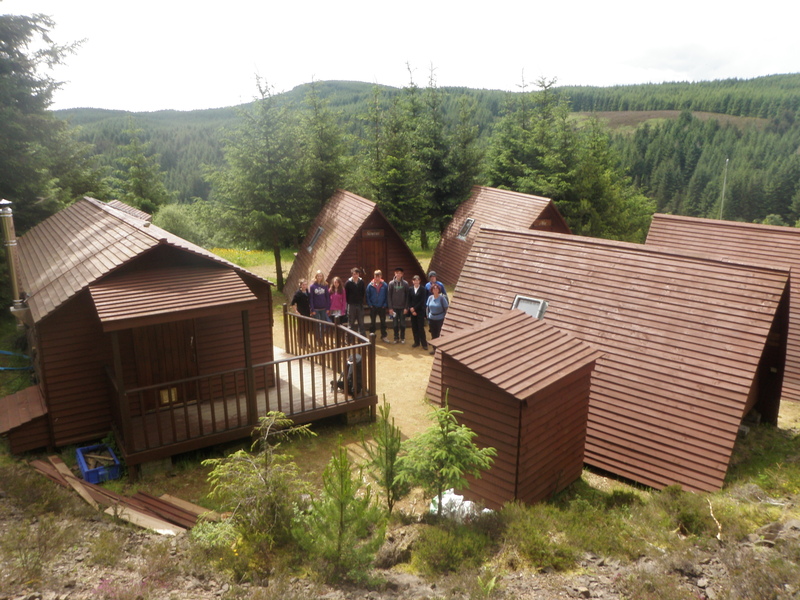 Overall I feel the programme has given me greater confidence and experience for planning/packing short outdoor trips. This covers many aspects from the planning the route, keeping the team safe, accounting for deteriorating weather conditions and bringing the right kit. The only improvement I can suggest would be trying to squeeze in more climbing sessions, however I know the weather over the winter 2010 made this difficult. Once again thanks Andy for a great year with SOAP! Thanks for this! My son has put his name down for next year’s SOAP programme. It looks like you’ve had a great time – fingers crossed he gets a place!